Last week, we started talking about seafood and potential contaminants.This week, we explore farmed fish. Though farmed fish seem like a better bet for a variety of reasons, there’s an enormous environmental impact with the exponential growth in the aquaculture industry. Being conscientious of what types of fish you eat and where they’re raised will help lessen the environmental impact of your dinner and hopefully keep you a little healthier, too. The rate of industry growth is unsustainable. According to Time magazine, “Close to 40 percent of the seafood we eat nowadays comes from aquaculture; the $78 billion industry has grown 9 percent a year since 1975, making it the fastest-growing food group, and global demand has doubled since that time.” Because people prefer to eat larger, carnivorous species of fish, it actually takes 10 pounds of smaller, open-ocean (pelagic) fish to feed a farmed fish that yields 2.2 pounds. For larger species, like tuna, it requires a whopping 44 pounds of pelagic fish to yield 2.2 pounds of fish for human consumption. The ecological impact on our oceans can be devastating. Our oceans are being over-fished for food sources to sustain fish farms. These prey fish are a valuable food source for wild predatory fish, marine mammals and birds. When you remove that food source, it throws off the balance of the whole ecosystem. Escaped fish from fish farms can also pose a risk to native fish populations. Many are genetically altered to make them consistent in weight and size, but their genes pollute local wild populations. Non-native fish that escape can overtake native populations and threaten the ecosystem’s delicate balance. Pollution from fish farms can come from excess food, fish feces, sea lice, antibiotics, chemicals and cage materials, helping to create “dead zones” in the ocean. And since fish farms are close to land, the nursery areas of wild fish are also affected. Farmed fish can cause health concerns for humans. 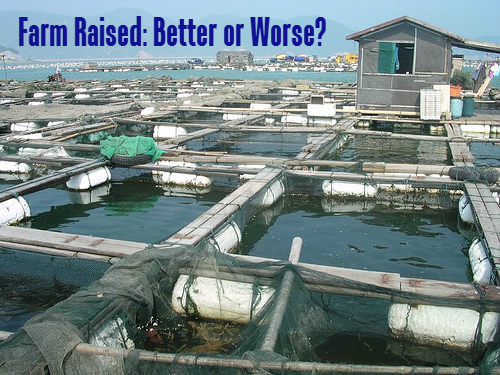 Antibiotic use in fish farms is part of the problem with overall overuse of antibiotics. When antibiotics are overused, bacteria mutate into super strains that are resistant to antibiotics. According to Time, over 70 percent of the world’s farm fishing occurs in China. Pollutants in China get into the food chain and increase your risk for consuming harmful mercury and PCBs. Additionally, many people eat fish for their omega 3 content; however, there may be virtually none in farmed fish, since they don’t graze, but are often fed pellets which may not contain omegas. Change the industry standards. According to Time, “WWF, formerly known as the World Wildlife Fund, has been working with producers, buyers and various NGOs since 2004 to craft voluntary industry standards aimed at minimizing…environmental damage.” This is a good place to start. Be a conscientious consumer. Eating more fish that live lower on the food chain could have a big impact with the industry and help restore balance in our oceans. Time states that oysters can give you the same health benefits as other fish, are extremely high in zinc and provide a positive environmental impact on our polluted oceans by filtering about 50 gallons of water per day. That said, there are challenges with filter fish, as they often maintain the contaminants in their bodies as they filter. They can also maintain drugs of all kinds that are in the water supply. Eating fish that are either omnivorous or herbivorous can help. Milkfish, carp and catfish are farm raised fish that require less feed fish or pellets made up of byproducts. For more information on how to choose the safest seafood, contact me, Linda Dulicai, at linda@The-Healthy-Zone.com or call me at 540-428-1949.